• Use layers of barrier protection between children and water to warn and impede. • A non-climbable four-foot fence that separates the pool/spa from the residence. Opening should be no more than four inches wide so children cannot squeeze through the spaces. • Self-closing and self-latching fence gates, side gates and doors leading to the pool/spa area, with latches above a child's reach (54 inches high). Gates should open outward. • Alarms on doors and windows leading to the water, installed about five feet above ground level so that a child cannot reach them. • Maintain all safety devices to ensure they are in good working order. • Secure and lock all doors, windows and gates leading to the pool/spa area when not in use. • Drain standing water from pool/spa covers. Remove covers completely before using the pool/spa and replace them immediately after use. • Never leave toys in or around the pool/spa and place items which can be used for climbing (tables, chairs, planters) away from fences. • Assign an adult "water watcher" to supervise the pool/spa area, especially during social gatherings. • Assign a second adult to maintain constant visual contact with children in the pool/spa area. Don't assume someone else is watching a child. • Never leave a child alone near a pool or spa, bathtub, toilet, water-filled bucket, pond or any standing water in which a child's nose and mouth may be submersed. 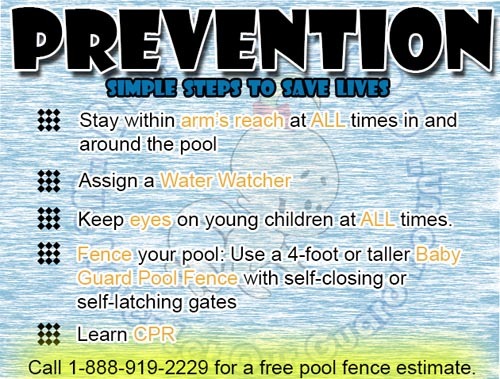 • Don't rely on swimming lessons, life preservers or other equipment to make a child "water safe." • Don't allow children to play in the pool/spa area. • Look in the pool area first if a child is missing. • Communicate pool safety measures with the baby-sitter and train the sitter in infant/child CPR. • Insist anyone over 14 years old has current certification in infant/child CPR. • Learn how to swim and learn rescue techniques. Mount rescue equipment by the pool (lifesaving ring, shepherd's hook and CPR sign). Many float-type toys are thought to be lifesavers. They aren't. They are only toys and should be used only as toys (arm floats and inflatable rings). • Post the 9-1-1 emergency phone number on your phones. Have a phone near the pool area. Don't leave children unattended while talking on the phone. • Teach everyone how to use safety equipment and how to call 9-1-1. 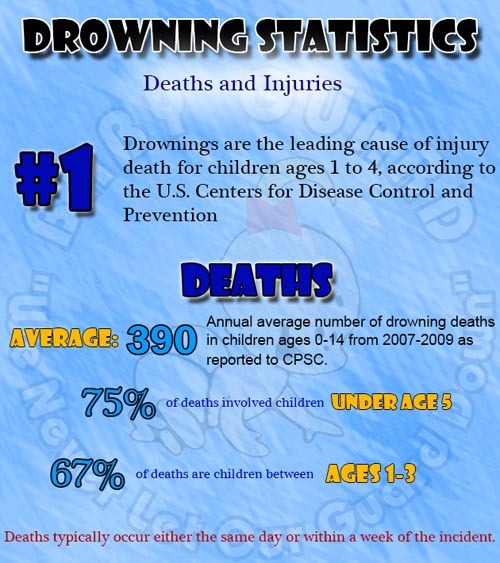 Drowning is the second leading cause of unintentional injury-related deaths to children ages 14 and under. It can happen in a matter of seconds - in the time it takes to answer the phone. There is often no splashing to warn of trouble. Children can drown in small quantities of water and are at risk in their own homes from wading pools, bathtubs, buckets, diaper pails, and toilets, as well as swimming pools, spas, and hot tubs. The statistics are frightening. Each year in the United States, 1,150 children (ages 14 and under) drown - more than half of these children are preschoolers (ages 0-4). An estimated 5,000 children (ages 14 and under) are hospitalized due to near-drownings, and of children surviving near-drownings, 5-20 percent suffer severe and permanent disability. Summer can be one of the most exciting and fun-filled times of the year, but also one of the most dangerous. Two-thirds of yearly drowning accidents happen between May and August so be prepared! 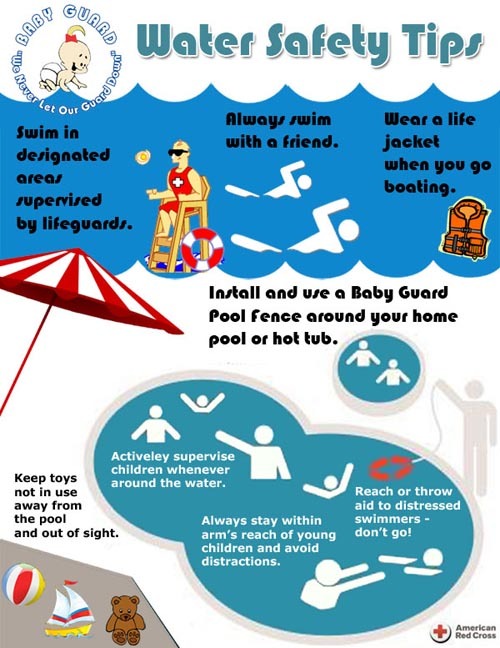 In recognition of Drowning Prevention and Awareness month, take a few moments to familiarize yourself with what it takes to stay safe and have fun. • Learn to swim. The best thing anyone can do to stay safe in and around the water is to learn to swim. Always swim with a buddy; never swim alone. • Know your swimming limits and stay within them. Don't try to keep up with a stronger skilled swimmer or encourage others to keep up with you. • Swim in supervised areas only. • Obey "No Diving" signs. • Watch out for the "dangerous too's"--too tired, too cold, too far from safety, too much sun, too much strenuous activity. • Don't mix alcohol and swimming. Alcohol impairs judgment, balance, and coordination, affects swimming and diving skills and reduces the body's ability to stay warm. • Always wear a U.S. Coast Guard-approved life jacket when boating and fishing. • Know local weather conditions and prepare for electrical storms. Because water conducts electricity, it is wise to stop swimming or boating as soon as you see or hear a storm. Every day, private home swimming pools are becoming more prevalent. Swimming pools are an excellent means of enjoyment for friends and family for most of the year. 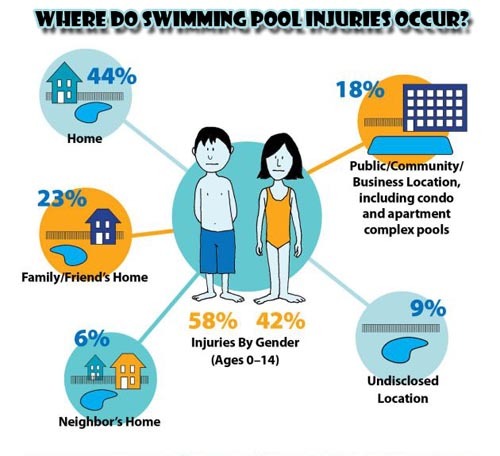 Swimming pools, however, can be very dangerous if not properly monitored. You must take into consideration the potentially unsafe properties of a swimming pool. Is drowning a serious problem? 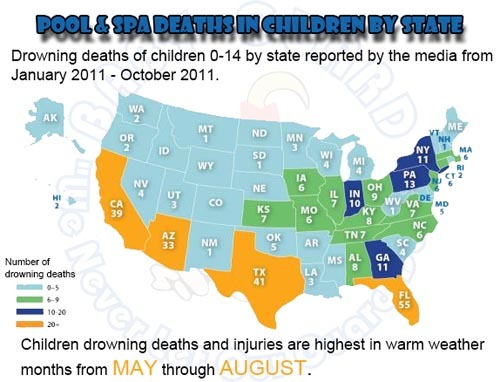 Drowning is the number one cause of death for children under five years old in Florida, California, and Arizona. According to government statistics, there are eleven near drowning incidents for every drowning. Many of these accidents result in totally disabling brain damage. 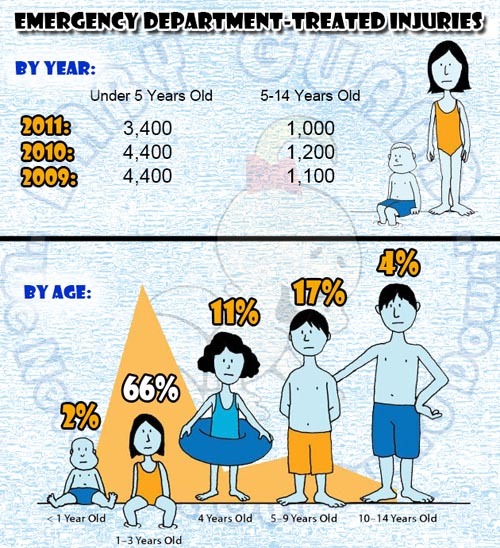 Supervision is always the primary layer of protection, but as studies show, 69 percent of drowning incidents occurred when parental supervision failed and there were not other "backup layers" in place, such as pool gates (with locks) or alarms on access doors. There can be no compromise on pool safety as it can truly become a life and death situation. Pool rules need to be set and obeyed. A pool drowning is not necessarily an "accident", it is foreseeable and therefore preventable. Keep your family safe this summer and be prepared! 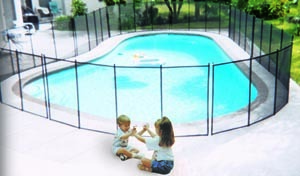 Learn more about your primary layer of protection, removable mesh pool fences. Right now.